I'm baaaaack! Did you miss me? I hope so cause I missed you guys! It was so hard not blogging for an entire week! I relaxed, refreshed, regrouped and am ready for 2015! Today's post will be recapping the gorgeous gowns of the 72nd annual Golden Globe awardswhich were last night. Were you watching? I most definitely was and was also live tweeting the entire thing so shoutout to any of my followers who are still following me after it! I love award shows for a variety of reasons, like the recognition of insane talent, but most for all the flawless celebs dressed in gorgeous gowns. Seeing all the celebrities dressed to the nines in haute couture designers is what I live for. Seriously. It's my guilty pleasure. There were countless just absolutely stunning dresses and then there were some not so stunning ones.... 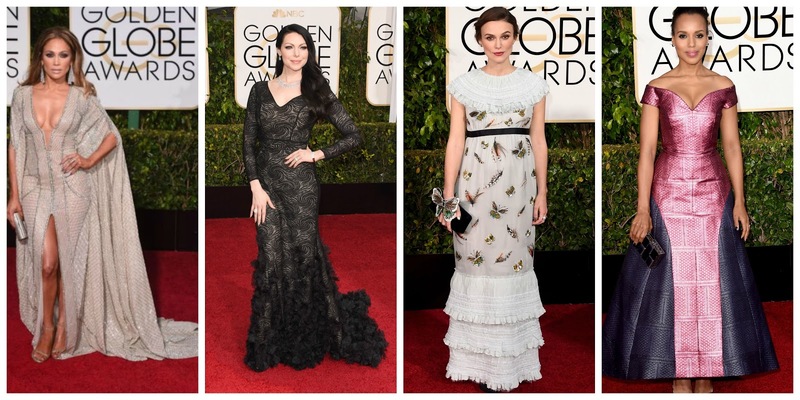 So today I'm recapping my favorite and not so favorite gowns from the Golden Globes! Kate Beckinsdale in Elie Saab, Anna Kendrick in Monique Lhullier and Greer Grammer in Lorena Sarbu. I am a huge lover of blush colored gowns. I think they're such a feminine color that just looks fantastic. I love Kate's gown with the glitzy top and simple bottom. Anna's is just darling and very flirtatious. Greer's is swoonworthy; all the detail in the crystals is amazing. I love how Kate's is elegant but definitely not boring, Anna's is the perfection of a dream and very fem and Greer's detail is stunning. Red gowns to me are the epitome of class and glamour. Catherine and Heidi delivered in their beautiful red gowns. Catherine's is a deeper red while Heidi's is more of a bright red. Both are gorgeous and make me want to go buy a red dress. Blue was an unexpected but popular color with a few other celebs sporting various shades. Amy's pastel blue one shoulder stunned and Katherine's navy mermaid wowed. I love the lighter blue with Amy's hair color and I adore the fit on Katherine's. First off can I say how much I want to be Amal Clooney? Not even because she's married to George but what a #WomanBoss she is. Tonight she brought her A++++++ game and made jaws drop in this one shoulder, black gown with white opera gloves. She's flawless. Emma always delivers on gorgeous, fun outfits for events and this is no exception. She made a bold choice and wore a pantsuit and ROCKED it! I love the jeweled bodice, crisp black pants and the bow sash. I'm in love with this look, just in love. White, silver and off white dresses were all in on the Red Carpet. I absolute adore, adore, adore Emily's cut out, halter gown. Seriously if I were going to prom I would get a gown like this. While some didn't care for Sienna's gown I happened to love it. I loved the plunging V, the slight high- low and the jeweled pattern on it. It's like grandma's dresses 20.0. Reese stuns again in a custom CK gown that's just as sparkly as her personality. She's gorgeous I can't even. Wow where to begin..... I like the idea of Rosamund's dress it just needs a lot more fitting. It's not a flattering fit for her and it shows. Tina's dress makes me scratch my head in confusion. She did redeem herself though by donning a suit/blouse set later in the show. Lana's dress is very 'Little Mermaid' from the pleats to the color to the tie front. Leave the dress in under the sea. Finally Lena's dress is just too boxy and awkward and not Golden Globe Red Carpet material at all. These gowns are hot messes, minus the hot. J.Lo's gown is too flashy and too much. While she's known for flaunty what God gave her it's just overwhelming and off putting. Laura's dress with the swirls is just a big fat no, no, no. I love Kiera and I was shocked to see her turn up in this science project gone wrong dress. What's up with the butterflies/bugs thing?! And Kerry's dress was so disappointing. The color and the shininess just ruined it. I've seen Kerry wear stunning gowns and this fell so flat. Olivia Pope would be appalled. So there you have it my best and worst dressed of the Golden Globes 2015. For the most part there were stunning dresses that rose above and beyond and other's that just fell flat. My top two favorites of the night were Emily Blunts white grecian dress and Emma Stone's pant suit. I love the simplicity of Emily's and the boldness of Emma's. "at these award shows i love to see what people are going to wear"
I liiive for award show season! The Globes, Critics Choice, Oscars, Tony's. I love it all! I agree J.Lo's dress while stunning, was too overwhelming for the Golden Globes. Reese is flawless as usual. Perhaps she'll sport color the next time? !